Well, we didn't get the blockbuster snow storm we were hoping for, but we have received several inches of snow each day for the last several days. Conditions are sweet here at Cranmore in North Conway, NH. 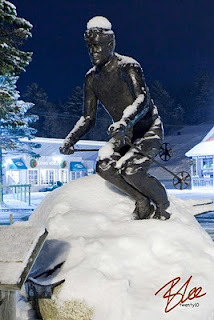 Special thanks to photographer Bill Lee who took this snazzy shot of our Hannes Schneider statue after we received a few inches the evening of January 1st. We're sure this frosty high top fade is Hannes' favorite hat. A Perfect Start to a New Year!